Attached to this page (at the bottom) is my default Total Commander settings file which I've been tweaking for a couple of years now. Total Commander is one of those wonderful apps which I simply cannot live without. I'm so utterly dependent on this app that It's scary. That being said I'm not to happy about some of the default settings in TCMD so as soon as I've installed it I replace the default configuration file with my own default settings. My reason for putting it up here is highly selfish. I wan't to have a single canonical place where I have my default settings but at the same time it might be useful to someone other than myself. Note that there's a lot of changes and I really don't keep track of them all. These are some of the changes that I can remember. F2 is mapped to cm_RenameOnly which gives you a nice little editable textbox right there in the file list allowing you to quickly rename files and folders with the (albeit windows centric) standard key. The same operation can be achieved through Shift+F6 in standard mode. 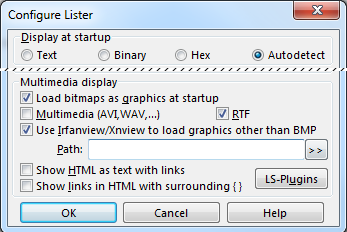 Right clicking on a file opens the context menu instantaneously. My default.bar includes a button for easily switching if hidden files are displayed or not. By installing irfanview and enabling it in options for lister (the built-in superviewer, accessed by pressing F3 on a file) you get an awesomme image reader built in to tcmd. (by pressing CTRL+Q in the list window the lister window will 'dock' in the opposing tab. This lets you quickly navigate around to preview your images). CTRL+Up arrow Open new tab with selected directory but don't focus it. This is the first time I'm making my config files available and I'm not making any guarantees. Maybe they work for you and maybe they don't. This version of the file also makes use of the ResolutionSpecific setting which, as far as I can tell, is only available in versions >=7.5a.